Yokogawa has completed installation of an oil movement and storage (OMS) system for CEPSA's largest refinery, located in Algeciras, southern Spain. This has considerably improved the safety, quality, and efficiency of off-site operations. The refinery's OMS now operates in a much more structured and effective way, with a tailor-made system based on Yokogawa's OMC 3000 and BPC3000 resource and movement planner. "Experience in installing similar systems in other refineries was an essential factor in supplier selection. 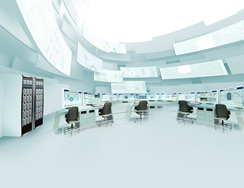 Yokogawa was the clear choice for installation of the OMS. In addition to having extensive experience and a successful track record in this field, they were the only candidate with their own distributed control system (DCS) and a complete OMS application," said Ramon Segura, CEPSA's Planning Manager. "With more than one hundred jobs carried out simultaneously in the movement area at Algeciras at any given time, CEPSA required a comprehensive and reliable system which could cope easily with such heavy demands," explained Andrés Marín García, General Head of Yokogawa Iberia, S.A. Improved security: off-site area operation security is guided and supervised by the system. Enhanced quality: system supervision minimizes possible operational errors that can cause product contamination. Improved environmental performance: movement control by the OMS resolves environmental problems caused by tank overflow and other factors. Increased efficiency: the number of operations carried out by each person is minimized through valve motorization and the ability to search the existing isolation for lined-up jobs. Extended area knowledge: complete area knowledge is available to all operators and is kept continuously updated in the system database, which defines every path for the jobs. The OMS is based on a path database. A path is the combination of resources required (off-site equipment such as tanks, lines, valves, pumps, analyzers, process units, berths, pipelines) between a source and a destination. It is unique, and has a direction (from source to destination). The OMS path database includes all possible paths. When the application is running, the operator simply selects paths from those in the database. In order to generate the paths for the database, all information related to lines, valves, tanks, flowmeters, etc. needs to be loaded into the database. Path generation for all existing source destination combinations and its later downloading into the database is done in a path server through Yokogawa's PATH3000 package. A job is the combination of a path and the corresponding resources needed to carry out an operation in off-site areas. All possible job sources and destinations require definition in the database. In the OMS there are two main job types: transfer job, a movement defined between a source and one or two destinations and blending job, a movement defined between several sources (up to 11) and one or two destinations. How many and what are the existing jobs in off-sites areas. What resources are used in existing jobs. Which products are moved in the jobs. Which resources are used for a certain job. This is always available in real-time. As resources are frequently from third parties, Yokogawa's DCS is compatible with even the most complex instrumentation and offers efficient solutions for communicating with any other systems. The installation required several customized changes were made for Yokogawa's standard packages. Because of the complexity of the paths, the maximum number of lines and valves included in a job was increased. Path information to the operator was improved and selection made easier. Graphic facilities were introduced to make job path selection by the operator more user-friendly. The system was developed to enable a clear view of the real isolation of the path when job-line up is completed. This minimizes valve operations and prevents line blocking. Options were included in the system to allow reporting on jobs done, for later study or investigation. One key feature of the OMS increased ease-of-use for the operator. The operator is guided by the system through excellent graphics facilities. Once the path for a job to be done is selected, the system provides a guide to line-up the circuit where the valves (manual and motorized), requiring a change of status appear. The job cannot be initialized until all the valves are in the desired status. During job execution, the system controls path line-up. Jobs are finished according to criteria previously defined by the operator. Implementing the OMS has lead to some changes in the organization. The control room operator becomes responsible for selecting job paths and controlling them. As this results in a higher workload for the individual, an additional control room operator has been added to the refinery's staff; however, the role of the main field operator can now be effectively performed by the personnel at the CENTUM CS 3000 operator stations. It has taken over five years to implement the OMS system. A dedicated team consisting of experts from Yokogawa Iberia and CEPSA has completed the implementation in six phases. CEPSA is the second largest petroleum company in Spain. It explores for and produces oil and also refines, transports, and sells oil products. CEPSA is a powerful player in the petrochemical industry, and its petrochemical and refining operations are highly integrated, including the management of raw materials, products, and energy. CEPSA has production facilities in Spain, Algeria, Canada, and Brazil, and it operates the Algeciras, Huelva, and Tenerife refineries in Spain. Together, these have a total crude oil throughput exceeding 20,000,000 tons/year. The Algeciras refinery is the CEPSA Group's largest. It produces all types of combustible products (propane, butane, gasoline, jet fuel, gas-oil and fuel-oil) and a great quantity of basic products for the petrochemical industry (benzene, toluene, p-xylene, o-xylene, etc.). The refinery has an extension area of 1,500,000 m² and a crude distillation of 12,000,000 tons/year. Refinery storage capacity reaches 2,200,000 m³, with 900,000 m³ used for crude and the rest for products. This capacity is distributed in approximately 150 tanks. The off-site piping network has a total length of 220 km. Refinery crude supply is done through a submarine line connected to a single mooring buoy that is situated one mile offshore and accommodates tankers up to 350,000 DWT in size. The refinery has its own port terminal with nine berths available for the loading and unloading of products and crude oil. The refinery is connected to the national pipeline network and inputs 3,500,000 tons of gasoline, jet fuel, and gas oil into it each year. Yokogawa has experience with more than 900 projects in the refining industry. As refiners strive for further productivity improvements and make a tighter commitment to HSE issues, Yokogawa's 50-year history of refining application know-how is helping its customers meet challenges.